A late review about the movie that is not new in a cinema. However, I still want to review this movie since the first one is my favourite animations from Dream Works production. Honestly, I was late to watch this animation, because in the past, I don’t have much time to watch the movies in the cinema. Now, I have many times to watch many movies that I want to watch. Then, I watch Hotel Transylvania and I was excited to watch the second one. However, the sad thing is when the serial of the movie that we are waiting for is not as good as the first one. It happens in Hotel Transylvania 2. 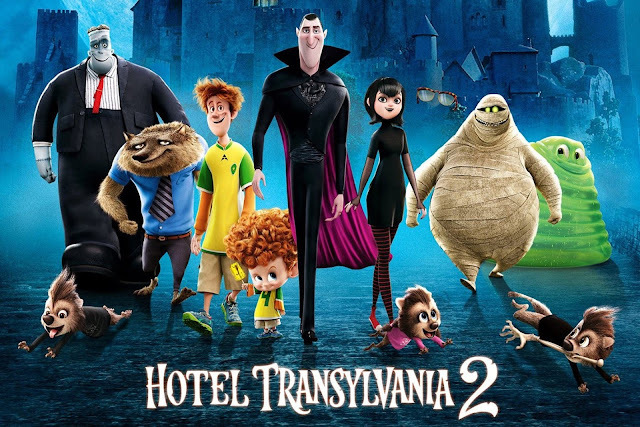 Hotel Transylvania 2 tells about a child, named Dennis who was born from human and vampire, Jonathan and Mavis. Drac who is Mavis’s father have a faith that Dennis is a vampire just like him. So, he teaches Dennis to act like a monster. That is the big line of the story. What I don’t really like from this second movie are the character of Jonathan in this movie is not as strong as the first one, Mavis turns to be over-protected mother and there are not much jokes that make me laugh so loud. Jonathan is my favourite character after Dracula in the Hotel Transylvania. He is really powerful, active and curious about everything. However, this second movie does not show many scenes about Jonathan. It is like he is the figure of the movie. He only shows up in several scenes with short durations. Not like as the first movie, in this second movie, he turns out to be just a person with a weird attitude which is the saddest thing moment for me who adore him since in the first movie. Moreover, not only the character of Jonathan and Mavis who are become different from my perspective, but the jokes are also not as funny as the first one. In the first movie, I laughed for many scenes in the movie, yet in the second one I laughed for a few scenes in the movie. It is funny but not in many scenes. However, it has the great story that many people or kids like. Personally, it is great movie, it is just not as good as the first one. What safes this movie from my judgement is that the cutie little Dennis. He is a cute and honest boy. What makes this movie is great is that the character of Dennis is strong. Just like as usual nice kids nowadays. He is full of energy just like his father, and he doesn’t want to see something bad happens. I really like Dennis in this movie. For you who expect high from this movie, I suggest you not to expect too much, because it is not as good as the first one. However, if you just want to watch for your relax time or just to spend your time with your family, it can be a recommended movie to watch.